One of the most important elements in design is contrast. Contrast makes design elements stand out, and draws the eye to important parts of your design. I’m just talking about color contrast today (there’s other kinds of contrast too! for instance, from textures). Johannes Itten was a famous artist and color theorist. One of his contributions was to describe the seven different ways that colors can contrast with each other. You can probably think of some of them immediately: light/dark, or warm/cool are very common. But maybe you haven’t thought of all seven! 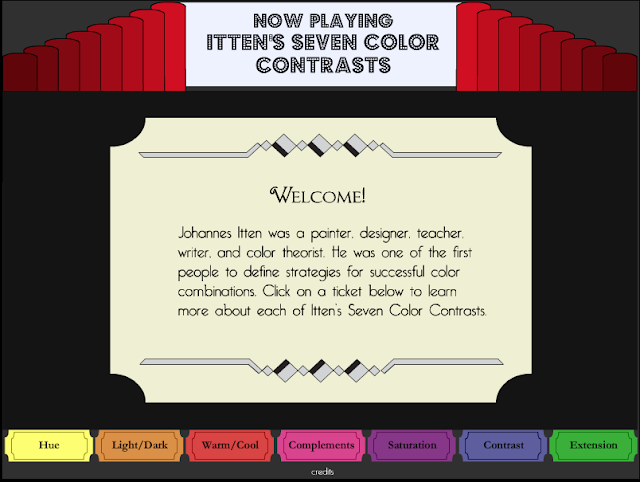 I found a fun flash website describing Itten’s seven types of color contrast. It’s set up as a theater: Click the ticket at the bottom to choose a contrast. It will display a title page with a definition of the type of contrast. A “PLAY” button will appear at the left. If you click it, the theater will show you an example of that type of contrast. If you don’t like animation, here’s another website with some examples of the seven color contrasts. This entry was posted in Color and design and tagged Color theory, contrast, itten. Bookmark the permalink. oooooo….. I’m off to play with it right now! Thanks! oh that’s a fun site! But it’s missing the tertiary colors! You do find some of the greatest ways to extend our knowlege of color. As one of those who really loves to understand the basis of why things (color, in this instance) are or aren’t successful in design, I appreciate these tidbits you send. The site Elmsley Rose mentioned is also wonderful. Thanks!! !